This site shows what you, as an employer, need to do to protect your employees when they work at height. It will also be useful to employees and their representatives. Considering the risks associated with work at height and putting in place sensible and proportionate measures to manage them is an important part of working safely. Follow this simple step-by-step guide to help you control risks when working at height. 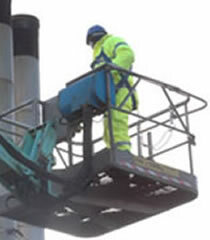 What do I need to do to comply with the Work at Height Regulations 2005? What do I need to know about scaffolding? Who is competent to work at height? The purpose of The Work at Height Regulations 2005 link to external website is to prevent death and injury caused by a fall from height. Sign-up below to receive emails with the latest news, information and updates for Slips, Trips and Falls. The health and safety toolbox Do you want guidance on simple precautions to take when working at height? Falls site Working at height is one of the biggest causes of fatalities and major injuries. Do you want detailed guidance on working at height?